Now YOU Can Play the Best Kept Secret in Chicago Golf! Open for limited Public Play for the first time in 118 years! One of the only public accessible Donald Ross designed championship golf courses in greater Chicago. an exceptional golf experience, Calumet needs to be at the top or your list. Join us for lunch, dinner, or book your next event. Click here to view our event information. Learn more about what it means to be a member at Calumet Country Club. One of the only public accessible Donald Ross designed championship golf courses in greater Chicago. 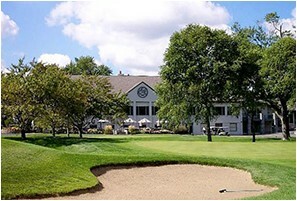 Established in 1901, Calumet Country Club has a long history of championship golf dating back to the 1924 Western Open as well as the 1945 Chicago Victory Open. The 1945 Victory Open will forever be remembered as one of the Eleven Straight Tournament victories that Byron Nelson achieved that year. Long known for some of the best greens in the area, whether you are looking at membership or for an exceptional golf experience, Calumet needs to be at the top or your list. Directly accessible by car or train; Calumet is situated east of the intersection of I-80 and I-294 providing easy access by car. In the city? Jump on a quick 30-minute train ride from downtown. Calumet offers the unique opportunity to arrive two blocks from the course via train, and be on the course in minutes of your arrival. Regardless of your mode of transportation, Calumet is ideally located for your next round.